Rolex 18038 - President Quick Set, 18k gold case and leather strap, also available with a bracelet, Unique and Beautiful custom refinished cognac dial. 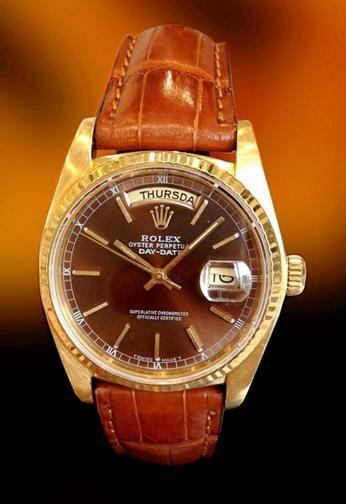 18K Yellow Gold Rolex DAY-DATE president. Reference 18038, dates production to 1980. 36mm 18K yellow gold case with screw back and screw-in crown, exceptional cognac dial with stick markers. 18K smooth bezel, sapphire crystal. Day at 12 o'clock and Date at 3 o'clock, this is a single quick set model.